Lunch might be over when the distant orange-pink mountains change their hue. But that doesn't mean you have to leave. Take a seat overlooking the Rickety Bridge vineyards. Sip a glassful of crisp estate wine and enjoy a delicious lunch while drinking in the splendour of the magnificent surroundings. 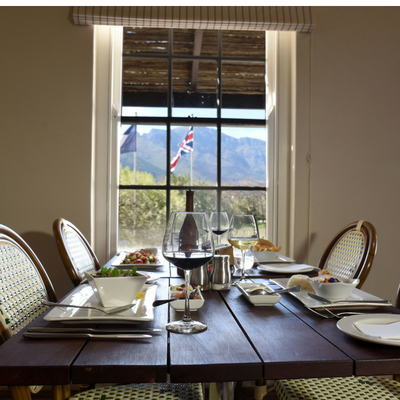 Every creation from our team of talented chefs is given extra zest by the striking beauty of the setting and stunning views of the Franschhoek mountains. Rickety Bridge is an enchanting Franschhoek wine estate that earns its place in the Cape's cuisine capital. 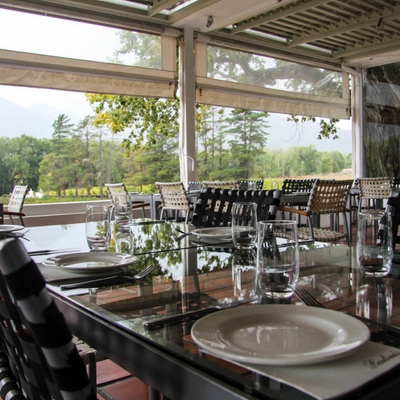 Franschhoek is home to some of the best restaurants in South Africa. Paulina’s is open for lunch seven days a week. The restaurant spills out from a cozy thatched area onto decks with views over the vineyards and mountains. Lovely venue, great food, fantastic location. We had a delicious meal in a beautiful setting - for a most reasonable price. I would definitely recommend to others to visit Paulina’s and the Rickety Bridge- it was excellent! Service and setting was spectacular. We throughly enjoyed our lunch and the wine was great. Have to say l was bit disappointed when we arrived here, having just come from Spiel and Delaire wineries which are stunning, l was expecting something on par with them. The food and service was good and the staff very friendly, but l wouldn't recommend to friends and family. The food was excellent- our booking was for 3pm and although we had finished our main course before 4pm we weren’t offered a dessert. There was a mistake made when paying the bill by card which immediately recognised by the waitress - overcharged by 400R. A refund was given but have to wait 7 days before I receive the payment- I would have expected that the bill be cancelled and the correct amount taken. would you be able to send me some more information in regards to the problems that you had on your visit. The waiter was difficult to understand and he could have been a little more interactive with the wine offerings and getting what you ordered to you so you could enjoy it with the course. I would have tried at least two more glasses. Absolutely delicious offerings - compliments to the chef! 100% for Lauren that serve us!! Our group of companies had a fantastic time at our Year End Function at Rickety Bridge. 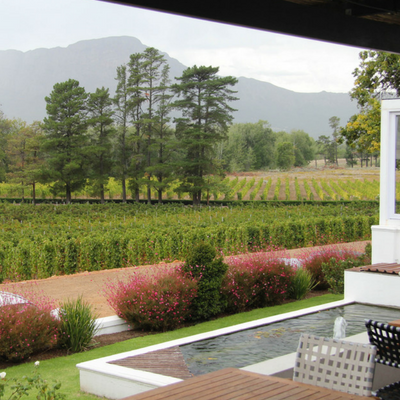 The staff were friendly and ensured our time at the wine farm was memorable! A big thank you for arranging everything for us and going the extra mile! The tasting menu is a very good addition but with only two options limited especially if you have food allergies or are a vegetarian as there are only 6 dishes on offer. One of the dishes had sold out on the day we came which was also a shame. I would also offer a small glass of bubbly at the start whilst you are waiting for the food and drink pairings. Great scenery, and the west coast mussels were delicous! Excellent - attended for lunch in a group of four who were short on time. Staff were brilliant in getting us great quality food and wine, and even getting the bill pre-arranged so we could still get our train, without compromising at all on the service, ambience and quality - great job all round! I very much enjoyed eating taster menu 1 with paired wine but I suffered badly in the evening and overnight. Something disagreed with me. I don’t have food allergies so it is unlikely to be a reaction to an ingredient. My wife had menu 2 and she was fine. Make of it what you will. The food was superb - one of the best meals that we had whilst we were in South Africa. The service was a little inattentive at times. Lovely experience, lunch was incredible (roast pork belly was cooked to perfection and i ighly recommend the cheese cake desert! ), the staff personable and very friendly and the wine is a winner - thank you Rickety Bridge and Paulina's Restaurant for a lovely morning with you! The staff at Paulinas are friendly and accommodating. The food is hearty and the wine is great. I've learned the table number for my favourite table and staff were more than happy to keep it reserved for me for lunch or to seat us near the fire if the day was a cold one. I think Paulinas could do more with the inside portion of the restaurant - it's cold and sparsely decorated. But the outside patio gives excellent views of the mountains and part of the valley. just keep an eye on the food temperature... one dish was cold and the rest just warm enough, otherwise super afternoon. The setting and service offered at Paulina's was lovely. The food was delicious for the most part was delicious however the curry was quite disappointing. It was not a butter chicken and had no spice to it at all. Our group had a great time at Paulina's. The staff were friendly and efficient. The food was outstanding! Sadly the service was extremely slow, we had to wait ages even just to order and starters arrived at about 2h30. Oxtail was a very small portion and some had grisel on. We eventually had our dessert at 3h45 and all the shortbread biscuits were finished so we only had crème brulee. Pity about the above because the setting, welcome drink, chocolates for the Mom's were all lovely touches.